Breakthrough empowers non-affluent students with the skills to enter rigorous college-preparatory high schools and attend a four-year college or university. Research shows that enrollment in higher-level math in high school is a strong predictor of college success and bachelor’s degree attainment. This process begins in middle school, when students are tracked into Algebra I (or not). Being placed in these classes is not a guarantee for lower-income students, who are less likely to know about the importance of taking Algebra in middle school, and who are less likely to advocate for themselves in the event that they are mistakenly placed in a lower-level course. Breakthrough works with families and schools to ensure that those students who are ready for Algebra I are not left out of the honors programs. Since they have attended Breakthrough’s rigorous summer programs, they are more prepared for this level of math. 88% of Breakthrough eighth-graders in 2013-14 are enrolled in Algebra I, whereas the national average for low-income students enrolled in Algebra I is 23%. Another strong predictor of success is the rigor of high school coursework. For lower-income students in particular, enrolling in college-preparatory classes (pre-AP and AP classes) is the key to entering and succeeding in college, but nationally, most lower-income students do not enroll in such tracks. 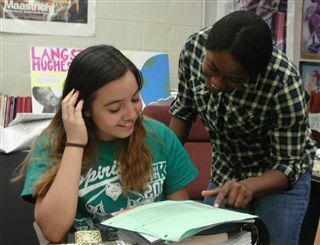 Breakthrough counsels our students into strong high school programs that offer rigorous pre-AP and AP coursework, such as the academically rigorous Gold Seal Programs and Schools of Choice. 95% of the Class of 2017 is enrolled in college-preparatory courses at various college-preparatory high schools across Fort Worth.